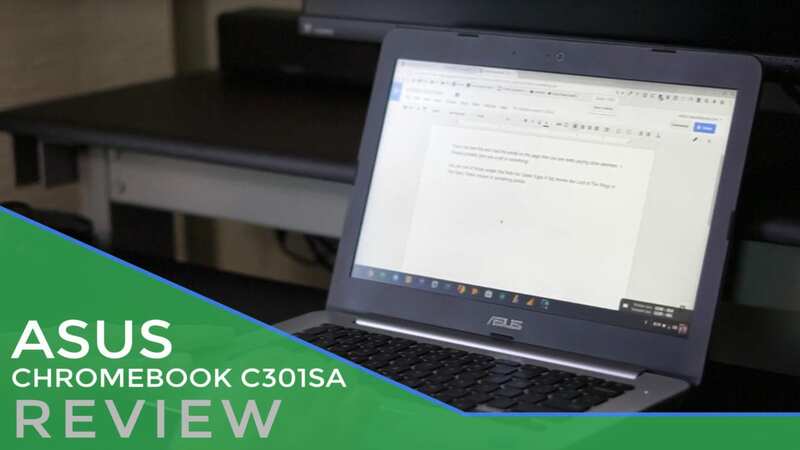 The ASUS Chromebook C301SA is a shining example of getting all the pieces right and somehow missing the whole. That’s not to say it’s a bad device. That also doesn’t mean I didn’t enjoy using it. But when the pieces that make up the whole don’t coalesce the way you expect, the result is a bit frustrating. As I remember that this Chromebook can be had for $270 – $300, my frustrations are quelled quite a bit. For under $300, this makes for a compelling laptop regardless of where the pieces fall. So, lets sort them out a bit. As soon as I opened the box, this device screamed ASUS. From the brushed aluminum-look plastic to the subtle curves that ASUS has employed in its laptops for years, this device is not a departure at all for ASUS’ design aesthetic. Like the C300 before it, this device is made of all plastic and sports most of the design choices ASUS has used in many, many laptops before it. It’s not ugly or unattractive, just pretty standard for ASUS. If you noticed, I said all plastic. There was a certain buzz around this device (namely for its inclusion of 64GB of internal storage at the base price – we’ll talk about that in a second) when it was announced. Coincidentally, the announcement came around the same time the Acer Chromebook 14 was just showing up on store shelves at the same $299 price. The Acer was touting an all-aluminum build, 1080p wide-angle screen, and all day battery just like the ASUS. With those similarities, we all just assumed this new ASUS was going to show up clad in aluminum as well. Granted, I made that assumption on my own. But the let down I felt when I got this out of the box was very tangible. And most of that reaction came from the fact that not only is the ASUS C301SA not aluminum, it is pretty flimsy plastic. Look, I’m not against plastic in devices: even higher-end ones. The plastic bottom of the HP 13 G1 never gave me any feeling of cheapness or poor quality. The plastic on the ASUS does. And I hate that for this device. As you’ll see in the other parts of this review, there are tons of great things on offer here, but they are all housed in this flimsy, cheap-feeling shell. I remember netbooks feeling this way. The keyboard deck has lots of give and simply feels budget under your palms. Most concerning is the creak and bend the laptop undergoes when simply picking it up and handing it off as if the keyboard deck and bottom shell are bowing and rubbing against one another each time you pick it up. The bottom is a separate color and texture, feeling more rough and grippy, but no less cheap. It also gives the device a fourth color, making the entire thing feel a bit pieced together. If you are keeping tabs, we have one color for the lid, one for the screen surround, one for the keyboard surround, and one last one for the bottom. It just doesn’t feel cohesive. Oddly enough, the screen portion of the Chromebook is decently firm and is the spot where flimsiness usually shows up. The hinge and screen feel pretty decent here even without a metal shell. Another thing to consider here is when on a desk or table, the low-quality body is way less apparent. In your lap, you feel the movement of the device constantly under your hands and on your thighs. A solid surface helps things out considerably. IT GETS BETTER FROM HERE, I PROMISE! Around the sides, we see a common and effective grouping of ports. On the left side, we are met with a custom power jack, full sized HDMI port, one USB 3.0 port, a full-sized SD card slot and headphone/mic jack. The right side is equipped with a single USB 3.0 and Kensington lock port. With its high-quality stereo speakers and extra-large resonant chambers that generate up to 87dB of high-fidelity audio, Chromebook C301 can deliver surround sound that’s as good as much larger laptops, with crisp and powerful audio to give you an immersive experience for both music and video streaming. And, I’d have to agree. The speakers are loud and full, faring much better than speakers in most Chromebooks. The downward-firing ports can impede the sound while in your lap, but on a table or not blocked by your legs, these speakers hold their own. Another very bright spot for the ASUS is the screen. I’m testing a model with the 1080p IPS antiglare display and am very, very pleased. ASUS touts a 178-degree viewing angle, 100% sRGB, 72% NTSC and 75% Adobe RGB gamut coverage. With its matte finish and solid brightness (I can’t find an exact rating anywhere), I can’t ask for much more from the display. Working anywhere, including outdoors, viewing angles are solid across the board and colors look great. Additionally, many of you have heard me complain at length about 1080p displays on 13.3″ Chromebooks. Fonts and UI elements are simply too small. Well, that has been largly dealt with by Chrome OS. Out of the box, every 13″ device I’ve come across recently defaults to the 1536×864 resolution. Sounds odd, but with Chrome OS’ scaling abilities finding their groove, this resolution keeps things nice and crisp while making all the UI elements pretty close to what we find on a 1600×900 display. Perfect. Easy on the eyes and still takes advantage of the extra pixels 1080p provides. Another thing I have to give ASUS some props on here is sticking with the laptop-only format in a sea of coming convertibles. At this price range and screen size, I’m all for this. I like convertibles just fine, but if we are working with a 13.3″ screen, the usefulness of the folding hinge becomes way more limited. Again, another win for this device. ASUS has opted for the butterfly hinge design that results in 1.5mm of key travel and very firm, solid keystrokes. It is quite simply one of the best keyboards on a Chromebook I’ve used. I love typing on this thing, and some of you reading this know that there aren’t many keyboards I get excited about. The trackpad is fine, spacious enough to do all the swiping, clicking and gestures Chromebooks are so great at. The click mechanism feels great, too. No weird bouncing or rattling here. Just a solid click every time. The surface is plastic (no surpirse) but does a decent job at rejecting oils and manages to stay nice and smooth for long periods of use. Inside, this review unit is rocking the N3160 Braswell Celeron processor, 4GB of RAM, and 32GB of internal storage. When this device debuted, its biggest claim to fame was the inclusion of 64GB of storage at the $299 price. When I ordered this one, it was $299 and that didn’t sit very well with me. But, at that time, there wasn’t a 64GB option anywhere for sale. For now, they are all listed as ‘coming soon,’ so that situation hasn’t changed much. What did change, however, was the price of the one I bought for this review. It has been dropped to $269, making way more sense for users and still giving us a ‘coming soon’ device that will include 64GB of storage for under $300. Just like other Braswell-powered devices, it gets along just fine on the day-to-day operations and manages to surprise me from time to time. I’ve said it before: when the performance of the device doesn’t get in the way of what you are doing on a daily basis, you’ve made the right decision in a processor. Most times, I wasn’t bothered by performance. Heavy websites or some more serious SVG editing can make things hiccup a bit here and there, but for most people, this device is going to have enough horsepower to get you through your daily Chromebook activities. ASUS lists a Pentium N3710 version on their landing page, but we’ve yet to see that device out in the wild. I’d love to know how that processor holds up, though. Battery life is quite good as well, and I was able to work for around 8 hours with the screen brightness at 75%. That’s plenty to get you through a work day, for sure. Battery life is a clear win for Braswell devices, it seems. As a late addition to this review, a few days before putting this post together, the ASUS received Android Apps in the Developer Channel. As with other Chromebooks, the experience has been great. The ASUS’ Braswell Processor takes any app or game to task and has been a pleasure to use. If you’ve come this far, perhaps you are as perplexed by this device as I am. Most of the sections above seem to talk about a device that I’d be crazy about and simply love. A great screen, keyboard, trackpad, battery and speakers are all the pieces you need to make a great Chromebook, right? With this one, though, the crazy-flimsy body is just something I can’t get past. Again, I don’t have any issue with plastic. I just don’t like cheap-feeling plastic. I don’t like the sensation that the slightest pressure might crush my device. I don’t like the feeling that it may fall apart. I don’t mind inexpensive. I just don’t like cheap. And it’s a shame that is the case. With all the great pieces on offer here, this could be a fantastic overall package. As it stands, I’m left not wanting to own it and having a bit of an issue recommending others pick one up. If a bit of a shaky body doesn’t put you off, I think you may fall in love with this Chromebook. From an input and usability standpoint, they got so much right here. Who knows, perhaps they will offer an all-aluminum version down the road. That, ASUS, I could get on board with.